Levy, the food service provider for Notre Dame Athletics, has expanded its partnership with Cultivate Culinary School & Catering to Purcell Pavilion and Compton Family Ice Arena, further contributing to sustainability efforts on campus and to food security and job training in the community. • 985 pounds of protein, including chicken and beef. • 1,102 pounds of starch, including potatoes and pasta. • 2,272 pounds of vegetables. • 2,336 pounds of fruit. • 400 pounds of baked goods and miscellaneous items. The amount of waste diminished over the course of the season as Levy adjusted to the demand for food at the newly renovated stadium, which expanded this year to include new event spaces, clubs and suites. Cultivate also works with Nelson’s, Fresh Thyme, Century Center and Rise & Roll. It has rescued nearly 40,000 pounds of food from those partners, and Levy, since August, when it first entered the food rescue business. “Randy Z and Jim Conklin are an inspiration to all of us. They are selfless, tireless service warriors who continue to make a dramatic impact on decreasing food waste in our community,” said Maureen McNamara, who serves as assistant director of athletics for Community Commitment, a division of Notre Dame Athletics. A nonprofit based in South Bend, Cultivate, with help from Stanz Foodservices and volunteers, processed and distributed the food to other nonprofit groups, including health care providers and food pantries, in an effort to fight food insecurity and train at-risk youth and adults for jobs in the culinary industry. That work will continue now at Compton Family Ice Arena and Purcell Pavilion following home hockey and basketball games. “We look forward to continuing to make donations to Cultivate throughout the basketball and hockey seasons whenever possible,” said Schirmuhly. As before, the food will be processed, frozen and distributed to local nonprofits in the form of pre-packaged microwavable meals. The meals will include a meat, starch and vegetable. They will help to feed the elderly, those with mental and physical disabilities, low-income individuals and families, individuals and families with medical problems or issues and other vulnerable populations. As part of a broader volunteer effort within the athletics department, Notre Dame athletes will assist with the process beginning next semester. In addition to food rescue, Cultivate is partnering with Goodwill Industries of Michiana on a job-training program for at-risk youth and adults. It previously partnered with The Crossing, an alternative high school in South Bend, on a similar program for at-risk teenagers. 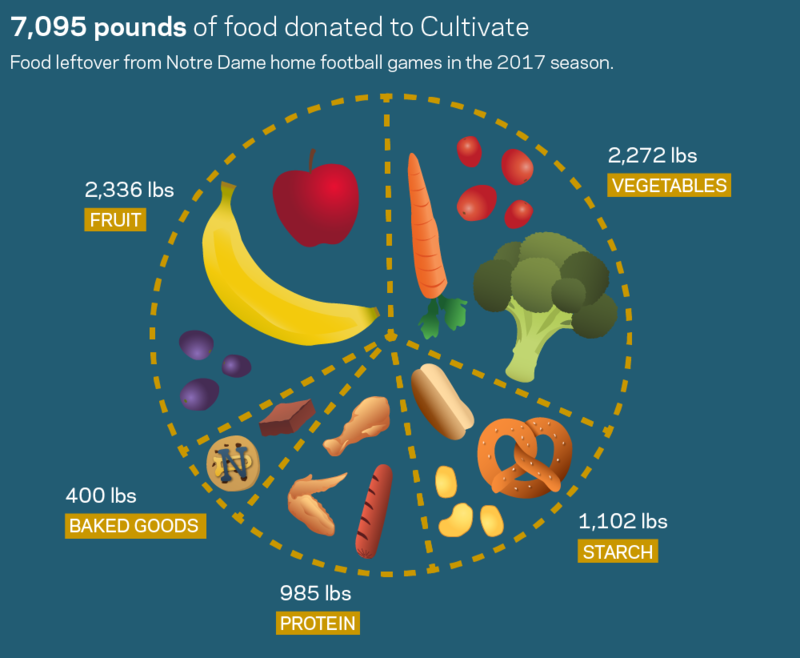 "While we continuously look for ways to reduce waste of any kind, with the multitude of athletic events here at Notre Dame, the reality is that we have excess consumable food. So we then look to the second ‘R’ — how can we reuse what we have,” said Carol Mullaney, senior director of sustainability and continuous improvement at Notre Dame. “It’s wonderful to have partners like Levy and Cultivate Culinary who are working together to ensure that any excess food is redistributed to area agencies serving people in need,” Mullaney said. “Because the pilot program during our football season worked so well, it is being expanded to cover the basketball and hockey seasons." Cultivate is one of three food rescue groups on campus and is part of an effort led by the Office of Sustainability, Campus Dining and various community and campus partners to reduce food waste and contribute to a healthier overall environment. Foodshare, a student-led food rescue group, and Food Rescue U.S., a technology-based food rescue platform with locations across the U.S., transport food from North Dining Hall and South Dining Hall and Au Bon Pain, respectively, to two South Bend shelters — Hope Ministries and the Center for the Homeless. In addition, Campus Dining uses smaller trays at South Dining Hall — and discourages their use at all dining facilities — to reduce waste and recycles raw and edible scraps for agricultural use, including as fertilizer and cattle feed. For more information, visit green.nd.edu. Originally published by Erin Blasko at news.nd.edu on December 21, 2017.